Sometimes I just can't wait for a particular book to hit my local library shelves. Tight-wad that I am --but betting on the come -- I paid the grandiose sum of $0.99 for a certain Kindle download from Amazon. (I have learned that was a one-time/one-day special; the cost is currently just under $11 for the download.) I got my money's worth, and then some! I had read the author's first novel (this is the second but I hope not the last) upon the recommendation of Arkansas Patti (The New Sixty) and enjoyed it immensely. I was happy to write to her a few weeks ago about discovering that there was a second novel, even though I had not yet started reading it. The story is described by one reviewer as "picaresque," and that it is; every one of its 433 pages contains some quirk that will leave you smiling, laughing out loud, or in sheer wonderment at the twists and turns of the plot. For sensible reviews, may I refer you to Amazon, and The Girl Who Saved the King of Sweden by Jonas Jonasson, author of the very successful The 100-Year-Old Man Who Climbed Out the Window and Disappeared (also recommended by yours truly) . As is my wont, when there are not pressing matters that must be attended outside my home at an early hour, I start each day playing games on the computer. Free Cell and Bookworm are my go-tos, both of which are my homemade tests for judging my present mental acuity. I am convinced that if I can make it through Freecell and make a decent score on Bookworm, my mind is working reasonably well and I can proceed with the day. If I have difficulties, I convince myself that another cup of coffee will sharpen my mind to the point that I can make it through the day without doing myself any major damage. This morning, as I was playing Bookworm, I marveled again, as I have literally hundreds of time in the past, at the richness of the English language. So many words; simple, complex, beautiful words! As I posted early in my blog, I have been in love with words since I was a teenager, inoculated with the love of words virus by my high school English teacher. I discovered the Oxford English Dictionary when I was a freshman in college. Having been exposed to dictionaries only the the form of the latest Webster's, I was amazed at the wealth of information on word roots and origins and the first use of words in the English language contained in the OED. As I was not very socially inclined at that time in my life, I spent many, many hours in the college library, where the 20 volumes of the OED sat on top of one of the long tables. I spent hours perusing those books. I'd like to be able to say that I had read the entire OED, but I fear that, even at my advanced age, I might have made it through, perhaps, a dozen volumes by now. A book that has managed to stay for over 30 years in my sadly diminishing personal library is the story of the creation of the Oxford English Dictionary. It is a biography of James Murray, editor of the original OED, written by his granddaughter, K. M. Elizabeth Murray, and first published by Yale University Press (1977). My well-worn paperback copy was published by Oxford University Press in 1979. Oh... it's title? CAUGHT IN THE WEB OF WORDS. If you love words, or simply have a curiosity about the OED, I highly recommend it to you. It's bitterly cold here today.I left my taps dripping last night, and was pleased to have both cold and hot water this morning. Although the weather is not as brutal as it is in some parts of the U.S., it's more than cold enough for us southerners. If there is a good side to it, it's cold enough to kill the remaining mosquitoes and, hopefully, most of the ticks and chiggers. Fortunately, it is just cold; no precipitation. That's due to move into our area on Saturday evening. I expect icy roads at church time on Sunday. We shall see what we shall see. in this the season of Thy Thanksgiving. for sun and rain and peace. 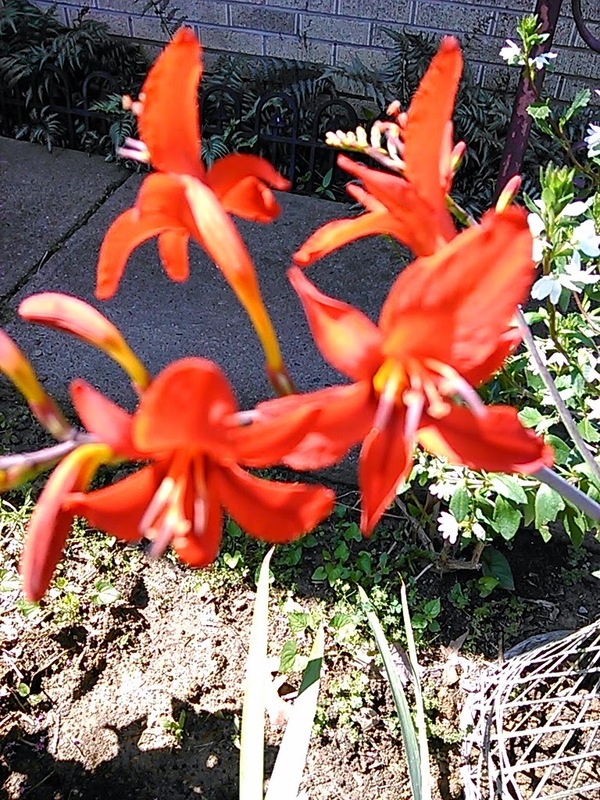 Gardening Daughter has gifted me with a new-to-me plant -- Crocosmia. She planted a couple of stems (sans any flowers) about a week ago in my front garden. It wasn't but a couple of days later that the plants had produced flower stems, and yesterday the first blossoms appeared. I don't know exactly what variety of Crocosmia this is... could be Lucifer, or perhaps Emberglow or Masonorum... names of several of the red varieties. Whatever the variety, it's unusual and very pretty. I can visualize large clumps of them gracing this area. She also brought me baskets of bright red Million Bells (calibrachoa), pink/purple/yellow Lantana, and a mixed dish garden of Lamb's Ears (Stachys byzantina); Angelonia and another variety of Million Bells. Very colorful! All this plant-gifting was in (unnecessary) payment for babysitting my granddaughter several days during the preceding week. Today is sunny... and dry, for a change. It has rained almost every day for the last week, varying between downpours and drizzle. The ground beneath the grass is almost boggy; goodness only knows when it will be mowed again. Where's a goat when you need one? Tomorrow is also a day -- and heavy thunderstorms are in the forecast. Ah, well!